By RedFoxYarns, on May 30th, 2017 In: Uncategorized. This is possibly the cutest little summer baby sweater I’ve ever seen! It was a *very* quick knit (one day!) for me. 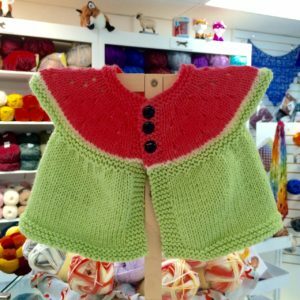 The pattern is free on Ravelry (click here: Watermelon Baby Cardigan). The one I did used Dreambaby DK, but there are also colors that would work available in Encore DK and in Calico! If you need a really fast, adorable summer sweater, I’m recommending this one!